The Performax TA2 Muscle Car Series heads to Sydney Motorsport Park for their championship debut at the popular Australian Muscle Car Masters this weekend, June 8-10. 14-cars will line up for the first of two events at Sydney Motorsport Park this year, as the series welcomes former Touring Car Masters racer Dave Falvey to the grid in a Chevrolet Camaro, joining Don Dimitriadis to form a two-car line up for Thunder Road Racing Team Australia. Third-generation racer Aaron Seton joins the series for a one-off appearance in the Castrol Harris Racing Ford Mustang. As previously reported, the son of two-time Australian Touring Car Champion Glenn Seton will fill in for regular driver Craig Harris who is unable to attend with personal commitments. 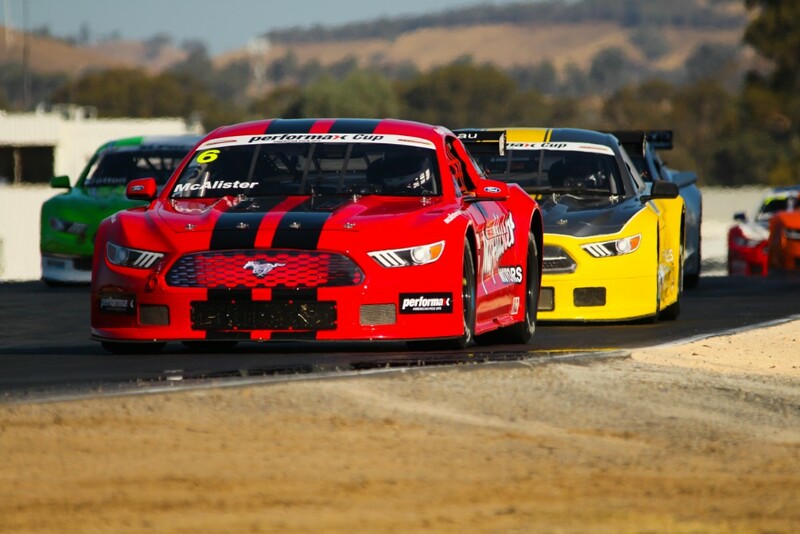 With three race wins out of the four on offer, RoadBees Transport Ford Mustang driver Russell Wright claimed the spoils at round two at Queensland Raceway, but it was New South Welshman Hugh McAlister who emerged with a one-point series lead over Wright. Without a win so far in 2018, McAlister attributes his lead to a consistent run of strong performances in the early stage of the season. “The way our points system works, if you have a bad result or a DNF it takes a long time to fight your way back to the front. The first two rounds I wasn’t the quickest, but managed to finish around the top three in all races so far,” explained McAlister. Series Manager Craig Denyer sees the Performax TA2 Muscle Car Series as a perfect fit for the Muscle Car Masters event, as the category continues to experience strong sales. “Sydney Motorsport Park celebrate the heritage of touring car racing in Australia very well with this event, and it’s great for our category to be a part of it,” said Denyer. “TA2 is an evolution of Trans-Am racing, which fed into Australian touring car racing in the 60s and early 70s. Many of the improved touring cars raced by Bob Jane and the like in that era came directly from Trans-Am racing. This event marks the first points-paying weekend for the Performax TA2 Muscle Car Series at Sydney Motorsport Park, following a demonstration at the 2016 edition of the Muscle Car Masters and sporadic appearances in local Sports Sedan events. The series returns to Sydney Motorsport Park for the season finale on October 26-28 with the Australian Motor Racing Series. Round three of the 2018 Performax TA2 Muscle Car Series will feature four races across two days of action on the Muscle Car Masters program. Races three and four on Sunday will be shown live through Muscle Car Masters’ social media channels thanks to a live stream provided by Blend Line TV. A post-produced highlights show will feature free-to-air on ONE HD following the event. Expressions of interest can be lodged via info@ta2racingaustralia.com. Don’t forget to like ‘Performax TA2 Muscle Cars’ on Facebook!